Bangladesh won the Dhaka Test against Windies last week to complete a 2-0 series win without employing the services of a seamer. In fact, they didn’t even pick one in the playing XI, leaving the spinners to get 20 wickets. The spin bowlers duly obliged in ensuring the home team won a Test by an innings for the first time in their history. As Bangladesh look to continue their progress as a Test playing nation, they will surely need to be more than a one-trick pony as a bowling unit. Since their introduction to Test cricket, Bangladesh have won just 14 Test matches with ten of those coming within the Asian sub-continent. Outside their comfort zone – read outside sub-continent – Bangladesh have registered just three wins in 34 Tests and have managed to draw matches only twice, a clear indication of their struggles when not playing on dust bowls. This trend is perhaps owing to extra onus placed on spinners and continually increasing dependency on them to win matches. 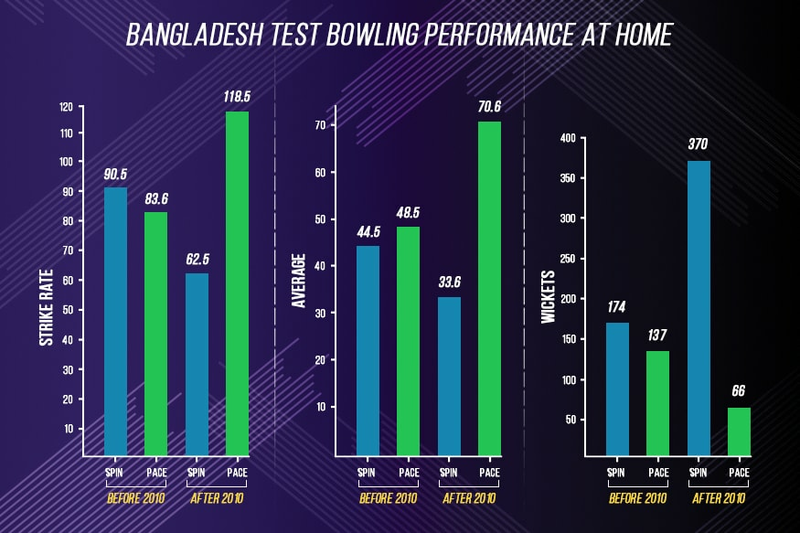 Bangladesh’s Test history can perhaps be divided into two halves – one before 2010 when they won just three Tests and one after 2010 when they started being viewed as a better side courtesy a win percentage of 19.61. This period also marks the beginning of a change in mindset in the Bangladesh camp. They realized that relying on the popular bowling success formula wasn’t proving to be helpful for them. Thus began an over-emphasis on spin and a reduced dependency on pace bowlers, a trend that saw them challenge mighty teams including Australia and England in their backyard. Till 2010, pace bowlers were as important a part of Bangladesh’s attack as spinners. They took 137 wickets as compared to the spinners who took 174, both at very similar averages and strike rates. Since then, though, the numbers are totally in contrast. Fast bowlers have only contributed to 66 wickets since 2010, an appalling number when you consider that spinners have taken 370. The average, which stands at 70.68 for faster bowlers, spirals down to 33.62 for spinners and they also strike at a much better rate than the seamers given that conditions are aligned to their tastes. The trend has hit a peak in 2018 with spinners picking up 97 of the 106 wickets Bangladesh have taken. The faster bowlers are just making up the numbers and have contributed just 9 wickets at an average of 53.44, easily overshadowed by the spinners who strike at a rate of 45.8 as against 109.3 for pace bowlers. Bangladesh could continue to devour visiting sides with this mantra but if they are to shape themselves into a successful Test side across conditions, they perhaps need to stop dishing out rank turners and playing an all-spin attack. It does add to the wins column for sure, but what it does for their development as a Test side is debatable.